The Fifty Shades trilogy had its time to shine as the goto Valentine's Day release for lovers and young couples looking to enjoy a day out at the theater. Now it's Death turn to find a little romance. Universal Pictures and Blumhouse have officially announced that Happy Death Day 2U will be in theaters for the most romantic day of the year. 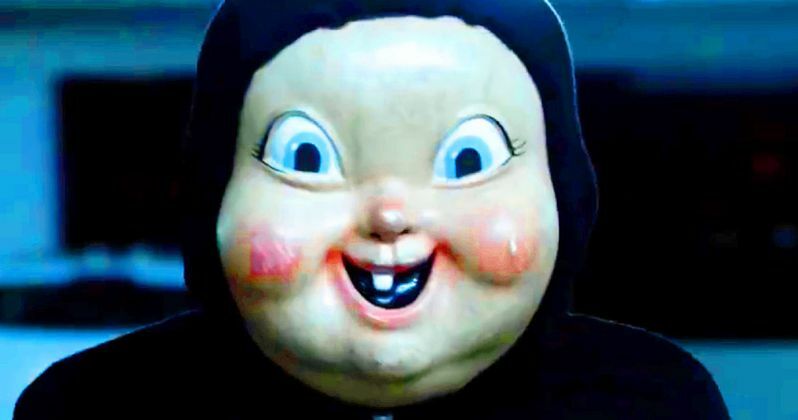 Happy Death Day 2U is hitting theaters on Valentine's Day 2019, February 14. And that sounds like the perfect time to hide behind your girlfriend as you grab her arm and scream in terror. Just don't dig your nails too deep into the flesh. Let's keep all the bloodshed on the screen and off those new plush theater seats. Tree will be back from the dead, on a constant loop, as she is viciously murdered over and over again in a Groundhog Day like massacre. This is the official sequel to Blumhouse's horror hit Happy Death Day, which hit theaters in October 2017, arriving as a Halloween treat the first time around. Jessica Rothe will be back once again as Tree Gelbman. And Israel Broussard is returning as Tree's hapless boyfriend Carter Davis. So you know we're in store for a few romantic scenes amongst all the brutal killing. Also back are Ruby Modine as Lori Spengler. Suraj Sharma, known for Life of Pi and Sarah Yarkin, last seen in American Horror Story, have also joined the cast this time around. Suraj Sharma has been revealed to be playing the character Samar Ghosh. He's a geeky science lover who does coding for fun. Sarah Yarkin joins the story as Dre Morgan, another science geek who's described as a Tom Boy. She is Samar's partner in crime. Jessica Rothe had this to say about the sequel when asked earlier this year. "The sequel elevates the movie from being a horror movie, and I wouldn't even say it's just a horror movie because it's a horror, comedy, rom-com drama, into a Back to the Future type of genre film where the sequel joins us right from where we left off, it explains a lot of things in the first one that didn't get explained, and it elevates everything." Rothe made these remarks to Collider. Original Happy Death Day director Christopher Landon is back to terrorize us all yet again. The sequel was shot and completed over the summer, with production kicking off in May. No further story details are being revealed at this time. We'll all just have to wait until Valentine's Day to see if Tree makes it out alive, or if her fate has always been sealed by the cosmos. Variety was the first to reveal the new title.